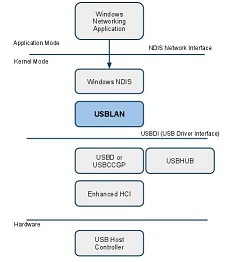 Belcarra's USBLAN class driver for Windows is a Microsoft Windows-based networking-over-USB solution compatible with both CDC-ECM and CDC-EEM protocols as well as the more recent and higher performance CDC-NCM protocol. USBLAN is available for Microsft Windows XP, Vista and Win 7, 32 and 64 bit versions. The driver is implemented as a Windows-based NDIS Miniport driver with the upper half being a standard NDIS driver and the lower half a WDM driver to access the USB peripherals. For smart devices an integrated bridge supports implementation of a virtual LAN between multiple smart devices. The implementation also includes built in servers for DHCP, RARP and Time of Day which optionally allow for simple configuration of both the host and connected devices. Infrastructure (Bridge/Router) devices that will act as an Ethernet packet bridge between the Windows system, its own local devices,and another 802.3 (Ethernet) based network, and/or route Internet Protocol packets to another IP based network. Each type of device implements a distinct type of network connection and must interact with the host in a correspondingly distinct fashion. The USBLAN driver recognizes the type of device by the type of configuration presented by the device during enumeration.